Haven’t you always wanted to read a George Orwell book besides Animal Farm and 1984? Me too! So I found a copy of The Road to Wigan Pier and read it. It turned out to be a masterful look at the working class and then at socialism. Orwell stresses the commonality of socialism being a form of justice and common decency — and not just for comrades and radicals. Orwell is also a realist and doesn’t pretend that there aren’t divisions amongst groups. As in Orwell’s time, socialism’s appeal needs to overcome its stigma. It might not be the only solution, but it can be an effective one. Examples are alive and well today, like public education and free software. Orwell immersed himself within the struggles of the working class. But more important, he wanted any struggling people regardless of class to understand their common challenges. The book follows Orwell’s political evolution resulting in the later chapters educating readers on socialism during a desperate time of fascism in the 1930s. He saw status and vocation dividing classes like a wall of stone — more accurately like a wall of glass that people pretend isn’t there, he says. The solution is to find common ground. Orwell expresses frustration with the basic tenants for socialism not being understood, and instead having a movement driven by the extremes. His urgent message to normalize socialism applies today. The tragedy of the commons is occurring in our oceans. See this month’s National Geographic story about plastic pollution. As Elinor Ostrom states, solving problems of the commons requires a collective solution. Applications of socialism can benefit our oceans, make US state colleges free, or ideally make a Facebook-like platform that’s publicly owned. Bernie Sanders introduced socialism into the last US presidential race, and Orwell’s message is starting to become more mainstream. And let’s not forget other places where we already have socialism: the US Postal Service and fire departments. And a favorite free software example of mine is the 3D modeling software, Blender. In the vein of George Orwell, this software is a shared resource, free, available to anyone, and maintained by a community. Because of the community constantly improving the software it has become robust application, as Blender.org says: “It supports the entirety of the 3D pipeline.” It’s also impressive how Blender has become an economic powerhouse in a shared-commons kind of way. This is good for business, not just freedom and fairness. Co-ops and socialism spread ownership. Maybe George Orwell would agree both are realistic approaches to justice and common decency. With the success of Black Panther in theaters, it brings to mind the cooperative and economic benefits diversity brings to society. And the HuffingtonPost reports that audiences want more diversity from Hollywood. 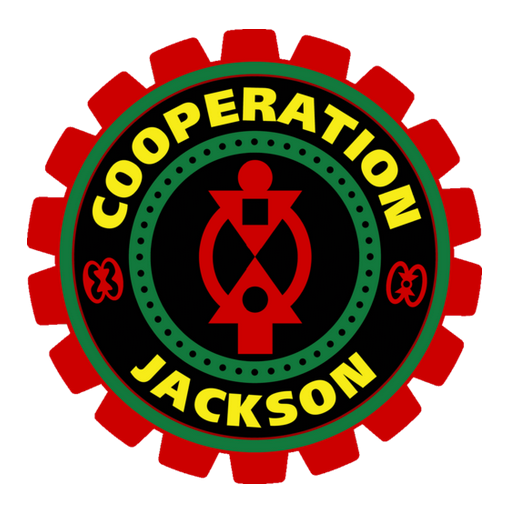 Considering the collaborative power of Black cooperatives specifically, I put the logo for Cooperation Jackson in this blog post. The Cooperation Jackson website has a great explanation of this logo, and a great explanation of African wisdom. Wisdom from Africa has a lot to offer a capitalistic society. I’ve discussed this in a previous blog post “Black Co-ops Matter” about the book Collective Courage that studies the history of Black co-ops in the US. Cooperation Jackson’s work to develop economic change and sustainability in Mississippi is now described in a new book Jackson Rising by By Ajamu Nangwaya, and Kali Akuno. See a review of the book at CounterPunch.org by Richard Moser. As I said in a recent post, cooperation rules competition. I look forward to more developments from Jackson. This month I had the pleasure of attending this year’s Platform Co-op event at the New School in New York. Organizers Trevor Sholz, Camille Kerr, Palak Shah, and Nathan Schneider showcased many experts and businesses that are making platform co-ops a reality. The participants represented an almost overwhelming array of accomplishments. But for all the innovation that these businesses are bringing to the world, the challenge of obtaining capital for co-ops is still real. Aaron Tanaka, director of Center for Economic Democracy, described the obstacles the Boston co-op, Cero, had to overcome to finance their co-op. They used the creative approach of a Direct Public Offering, which they paid for, and then needed nearly 100 investors to raise $350,000. This is a great success story, but it should be easier. Financing a co-op is still not understood by financial institutions, according to Elvezio Del Bianco from Vancity Credit Union in Vancouver. Some presenters offered financial solutions. Brendan Martin from Working World discussed a cooperative network of shared funds called The Madeline System. Elvezio Del Bianco’s Vancity supports new cooperative enterprises. Christina Jennings represented The Shared Capital Cooperative, a national loan fund committed to investing in cooperative enterprises. Derek Razo offered innovative financing at Purpose Economy Ventures. But Joseph Blasi caught my attention by suggesting that co-ops find funding via Employee Stock Ownership Plans (ESOPs). He says ESOPs should be a more utilized by co-ops for capital. ESOPs offer a vehicle for funding that is proven. I’ve considered ESOPs separate from co-ops. According to The Cooperative Development Institute (CDI) in Massachusetts, ESOPs can be hierarchical because they form a trust not necessarily owned by employees. But ESOP structures can vary, and could be setup to form an employee-owned business. It would appear ESOPs can be a solution. But they can also be expensive for small businesses mentioned in a report from the Democracy at Work Institute (PDF). Financing co-ops can be a challenge, but this gathering of expertise offered encouragement. You’re a small organization, and you need to set up a reliable website. If you want a robust site, Drupal can provide endless solutions. Drupal is free, and can be a very powerful content management system (CMS) for your site. But the tech side can stop you from getting it started, and from maintaining the software. A platform co-op called Drutopia, mentioned in a previous post, wants to simplify the tech side of Drupal for your website. You’ve probably used a content management system (CMS) for the web before — WordPress and Drupal are the most well-known. These CMSs provide people with little technical savvy the ability to create and manage content. But CMSs need a software ‘stack’ to be setup and run, including a web server, PHP, and a database. Drupal also needs to be updated; a lot. Add to this the ins and outs of Drupal 8 and tech aspects start to pile up. If you want to see who uses Drupal, check out Drupal.com. But you’ll see on this site that Drupal 8 is (currently) promoted as an enterprise platform, ie, for big organizations. Drutopia wants to bring Drupal back to small organizations. WordPress has WordPress.com to help you run your WordPress site. Similarly, Drutopia can help you run your Drupal site. It’s based on software as a service (SasS). Pooled solutions include a Drupal 8 configuration with elements that can be used by a wide range of users. Low or no-cost installs will also help small organizations that need to get up and running. 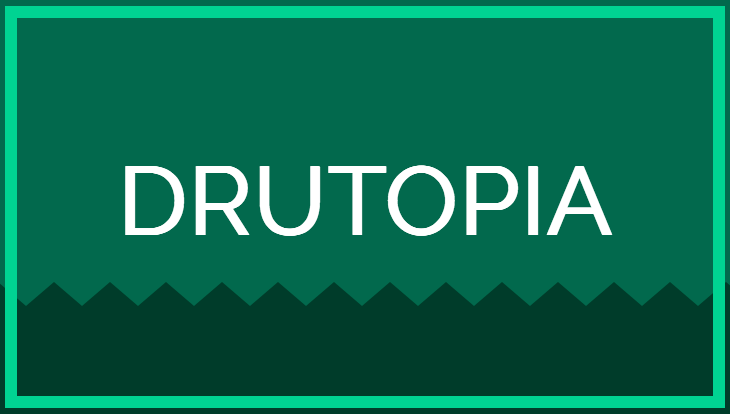 However, it’s the ownership structure that will make you a member and owner of Drutopia. A service fee and collaborative model will support all stakeholders: users, designers, site builders, and developers. This can build a vibrant support structure so your small organization can focus on what it needs to focus on. Sign up for Drutopia at Drutopia.org to stay involved with its development. I just received a ballot in the mail from my life insurance company, SBLI. They are actually letting me vote for increased membership rights. SBLI is a national insurance company based in Massachusetts with customers in all 50 states except New York. The Board of Trustees has unanimously decided to vote on becoming a mutual insurance company, or known in the industry simply as a mutual. I applaud the move. The more mutuals in the US, the better. A true cooperative structure comes from democratic governance, and the degree to which SBLI becomes democratic remains to be seen. But SBLI’s move away from outside investors removes an extractive element of the business. This move to a mutually owned structure will cut down costs for all members (ideally), create independency, and improve sustainability. A graphic showing the top 300 international co-ops from “Exploring the Co-operative Economy” by ICA and Euricse. I’m writing about imagination because I need to. The co-op movement needs it. To consider the ideal instead of the worst. Imagining the worst possible scenarios breeds propaganda, invoking fear and threats to safety, that keep us from working together cooperatively. We need to envision a better world. It can be difficult to do with propaganda and the distraction of what Chris Hedges defines as spectacle. We’re lucky to have important intellectuals like Noam Chomsky and Chris Hedges analyze our present reality, but they paint a bleak picture. Therefore, we need to first be informed on realities then consider growth, prosperity, progressive economics, and cooperative solutions. Cooperative solutions are in the past and present. Collective action is part of American history and can capture the imagination – imagination that is being fought for. It was modern propaganda, created on a mass scale for World War One, led by George Creel, that changed progressive politics and how Americans think. See Chris Hedge’s book Death of the Liberal Class. We owe a lot to those that have maintained imagination for co-ops. Nathan Schneider and Trebor Scholz are editors of Ours to Hack and Own, and creators of platform cooperativism. They’re tenaciously imagining new forms of ownership. A review of the book and the movement is nicely summarized by Makery.info. With a vision, we start to think of how. Thanks to Nathan Schneider, we’re considering specifics on how to build a better web. Twitter could be owned like the Green Bay Packers; maybe too ambitious, but it’s visionary. And it has evolved into more thinking on the topic. The latest news on #BuyTwitter is described on Shareable.net covering innovative thinking from Nathan Schneider, Trebor Scholz, Douglas Rushkoff, Chris Cook, David Hammer, and Rachael Lamkin. So, first, don’t be lazy about your news sources. This will affect your ability to imagine what is needed for our cooperative future. Ironically, I think you need to read the worst case scenarios on news sites such as CounterPunch.org (which wrote about co-ops this month), but then picture a good future. Truthdig.com is another alternative news source. Then, second, don’t forget to read YesMagazine.org, and Shareable.net. Co-ops are a bigger part of society than people realize. The 2016 report “Exploring the Cooperative Economy” by the ICA and Euricse reports $2.5 trillion in annual revenue earned by the world’s top 300 co-ops. 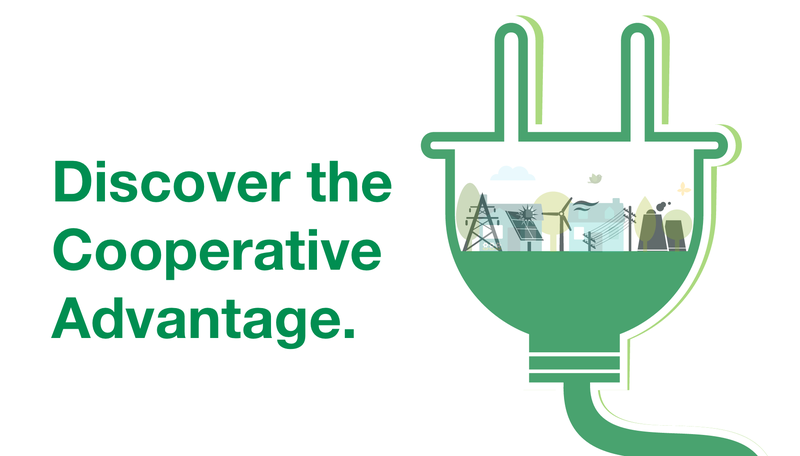 Co-ops can solve social, economic, and sustainability issues. We need the power of the collective action in the coming years. Standing Rock is showing how it’s done. And we need a lot of imagination. Let’s create good news with co-ops. We all use Google web apps, part of Google Drive. How can you not? They are easy to use, collaborative, convenient, easy to access, and make file storage easy. Schools in my town can’t get enough of Google web apps for teaching. But here’s the thing: you use the app, but you don’t know where the information is stored and what is done with it. Next, you don’t have control over modifying the platform if you had the technical inclination to do so. And lastly, you don’t own any part of the software or the platform. I’m looking for an alternative. Specifically for Google Docs and Google Sheets, their word processing and spreadsheet apps. My solution is to put two other existing web apps on a server. They are Etherpad and EtherCalc. Etherpad offers collaborative document editing. EtherCalc is a collaborative spreadsheet app. They are free and open source software (FOSS). My two-app platform available for the potential hordes of web app users, or just say me for now, will provide the apps, hosting access, and ownership of the platform. Anyone who uses the platform, or develops it, can become a member and owner. This is platform cooperativism where “communal ownership and democratic governance” are the core tenets, as stated by Trebor Schulz in the new book he co-edited called Ours to Hack and to Own: The Rise of Platform Cooperativism, A New Vision for the Future of Work and a Fairer Internet. These two aspects have evolved with co-ops through history. They’re now being advanced by platform cooperativism for the web. Let’s say the idea grows and audiences come to the platform instead of Google Drive. If some kind of fee-for-service is instituted, patronage payments at the end of the year would get paid out to all members like other co-ops. Do we scale up and run rampant through the American educational system like Apple and Google? Members may also be asked to invest to raise capital. The direction it could take would depend on the owners/members/workers. Governance of the members is always a challenge, legally and functionally. It’s different from projects that Yochai Benkler in Ours to Hack and Own calls peer production environments such as Wikipedia. Platform co-ops must develop a model that distributes democratic decision-making and ownership for a multi-stakeholder membership/ownership group. Janelle Orsi and David Carroll in Ours to Hack and Own advise careful legal preparation, as “novel legal frameworks” are required for platform co-ops. 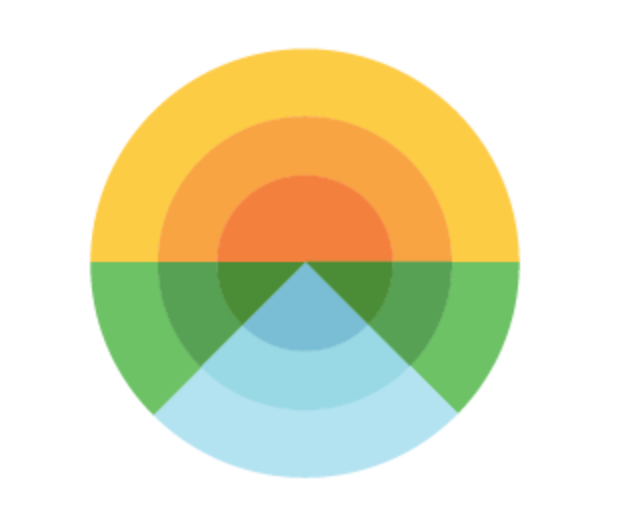 For group decision-making, a tool I have advocated for previously is Loomio. I also like their membership approach where a new membership can be free, but they encourage donations. My plan is based on software that someone else wrote, and this example shows, in a very basic way, why we must have free and open source software everywhere. Innovation needs collections of software, and the more we have access to, the more we can innovate new platforms for the internet. Software licensing is paramount for computer user freedom, giving access to software source code, and the ability to do with it what you like, advocated by the Free Software Foundation (FSF). The license for Etherpad is Apache license 2.0. It’s a license the Free Software Foundation deems acceptable in terms of free software standards. “The Apache License 2.0 is the best non-copyleft license that does what a copyright license can to mitigate threats from software patents,” says FSF who holds all software licenses to the standards of the General Public License (GPL), or copyleft. Ethercalc is also free software, with a license called CPAL. This license is less accommodating according to the FSF. CPAL is not compatible with GPL but still allows for the use of source code. For now, I’m a one-man revolution with my web-app platform. If it remains that way, I can handle defeat. My previous revolution to make Google a worker-owned co-op has gone unfulfilled. The movement is massive. And it can save the world. It’s the co-op movement worldwide. 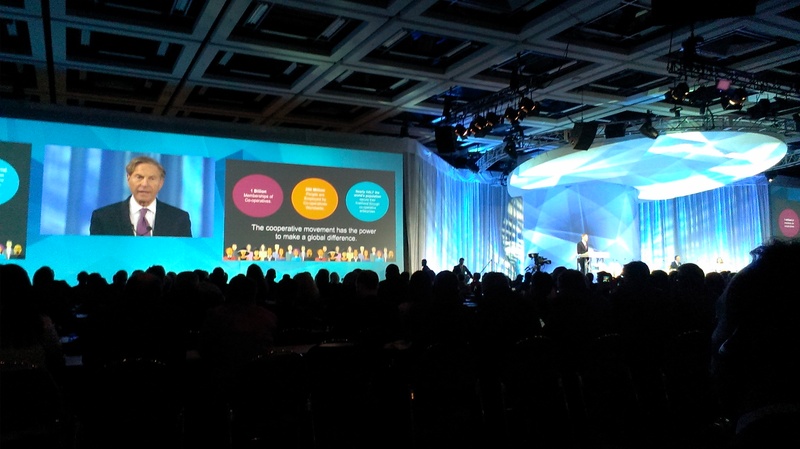 Co-ops as a solution to the world’s problems was a predominant theme at this year’s International Summit of Cooperatives hosted by ICA and DesJardins October 11-13 in Quebec City. At the event economists Joseph Stiglitz, Jeremy Rifkin and Robert Reich all touted the critical role for co-ops. But it’s time to make a broader audience see the light. Cooperatives have a strange identity crisis right now and can be viewed in the mainstream as not viable and/or not modern — an issue also agreed on at the conference. As Robert Reich said at a presentation on October 12, we have to raise the co-op voice. Vic Van Vuuren, from the International Labor Organization, said in an October 13 session, we must externalize the value proposition of co-ops consisting of the triple bottom line: economic, social, and environment. Nicole Alix, President of La Coop des Communs in France said let’s reach out to activists. And Charles Gould, Director-General, in charge of the e, International Co-operative Alliance in Belgium, mentioned the irony of large and influential co-ops — in many cases, co-ops with thousands of members — being unknown to the general public as cooperative organizations. 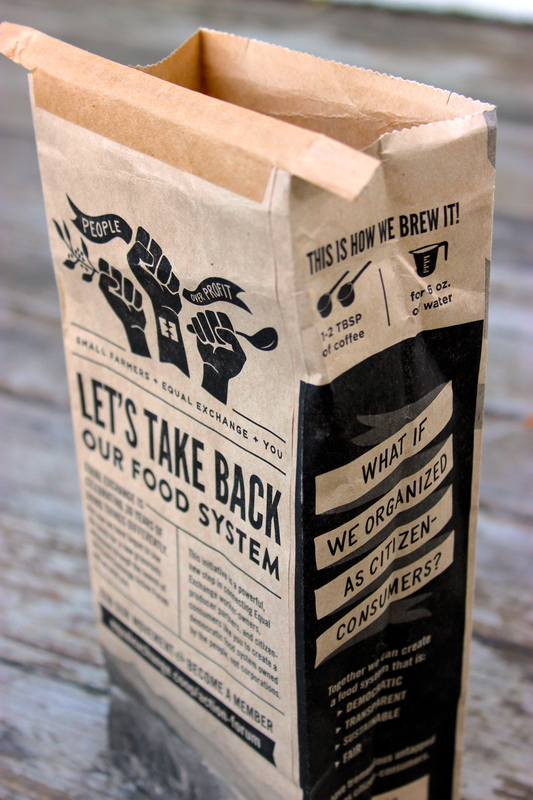 The need for promoting co-ops you’ve likely heard before. But at this summit about increasing our capacity to act, Howard Brodsky, CEO, Chairman and Co-Founder of CCA Global Partners showed how he is doing it. He’s created a promotional campaign at cooperativesforabetterworld.coop. What Brodsky described in a session titled “Making Cooperatives the Way of the Future” was the need to tell stories. Stories are how people remember things. If we want people to understand and remember the co-ops that exist around them and what they have to offer, then we must tell their stories. His approach is to answer the why of co-ops, and he’s created multiple videos that answer this question. He showed two well-produced videos at the summit that shed light on what co-ops have to offer in brief but effective messaging. Telling why co-ops are a solution will be slightly different depending on the co-op sector. But he says that each sector needs to tell their stories. 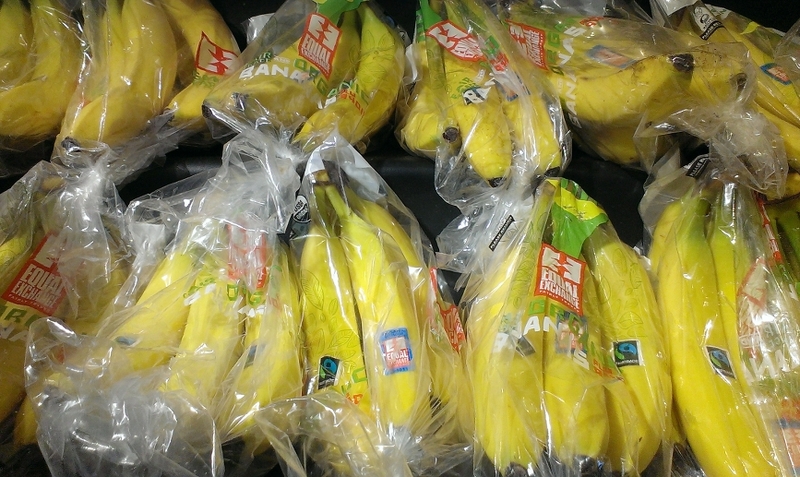 This marketing effort is a bridge for educating the general public on the value and benefits of co-ops. Coopertivesforabetterworld.coop is a resource with videos, sector descriptions, and blogs. Under the link “explore,” there is a video that describes a co-op. 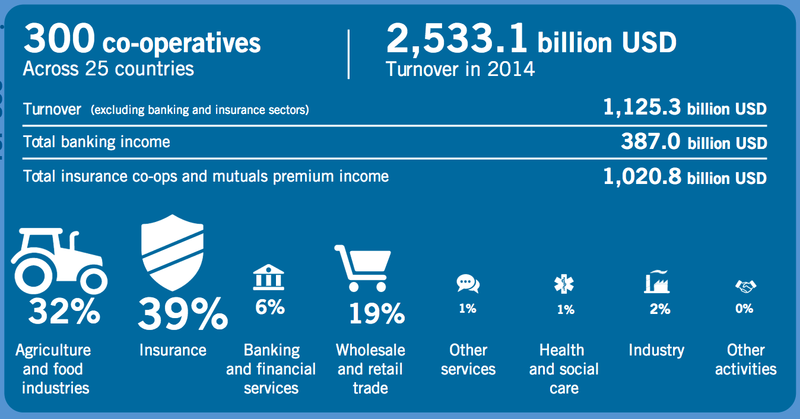 Another link divides co-ops into nine sectors. Let’s brand co-ops as a mainstream business solution. Howard Brodsky is showing the way. Some videos promoting co-ops I produced can be viewed at Kingbird Content. One video explains co-ops in 60 seconds. In early August members of the web development cooperative, Agaric, presented to two Boston area audiences on platform cooperativism. Platform cooperativism brings cooperation and collective control to platforms built for connecting people, services, and products. Ben Melançon from Agaric presented to the first audience, a group of web developers in Boston that meets regularly to discuss the content management system (CMS) Drupal. Drupal is widely used because it is powerful software, but it’s also free – free software is also known as open source software. The worker-owners at Agaric, particularly Micky Metts, have been working hard to bring together the movements of cooperatives and free software. Ben’s presentation introduced platform cooperativism which offers something related to both cooperatives and free software: ownership. Distributed ownership of online platforms can benefit both developers and users in a cooperative structure that platform cooperativism champions. Ben presented the possibility of funding a given web project by users. What if musicians, for example, invested in a music sharing platform that serves them? This would give the developers and the users of the platform a source of capital. Developers and users would also be owners forming a hybrid of stakeholders, creating a cooperative platform. Turning users into investors can be a powerful impetus for web development. At a second event this month promoting free software called Libre Boston, the task of explaining platform cooperativism fell on the shoulders of Micky Metts and Chris Thompson from Agaric. Micky described the path toward platform cooperativism as a bridge. We can’t expect full investment in free software or platform cooperativism, but we can encourage incremental steps onto the bridge leading us toward platforms (and software source code) we can own. An integration of alternative software can liberate us from proprietary control. Switching to a Linux operating system from proprietary software is one example. Chris emphasized the hybrid nature of platform cooperativism and drew attention to the hybrid Black Star Co-op in Austin. Although Black Star isn’t a cooperative platform, its innovative hybrid ownership structure bodes well for the multi-stakeholder ownership that platform cooperativism advocates. The advent of platform cooperativism is fitting for the mission Agaric has been touting. An additional Drupal project was announced this month giving users a role in the development of online tools for organizations. It’s called Drutopia, announced by Chocolate Lily Web Projects. And in November, another platform cooperativism event is happening at The New School in New York. Sharing might not be sharing. A major rebuke of the sharing economy kicked off last November with Platform Cooperativism in New York. The event brought together thinkers and builders of a more cooperative internet and was described as taking back the internet by Co-operative News. Since then, a defining factor of whether you see the sharing economy as part of the problem or part of the solution, is whether you see Uber as part of the problem or part of the solution. Others point to Uber as a successful example of the sharing economy. If you check #sharingeconomy on Twitter, you’ll see admiration for Uber with a tweet about Hertz joining forces with Uber. But in the same thread is a Shareable article from last November, comparing Uber to the Death Star. And the Uber debate has now been taken up at the Stern School at New York University. Professor Arun Sundararajan has written a book questioning status quo sharing economy services. Called The Sharing Economy, Forbes magazine reports the new book has a chapter hypothesizing Uber becoming a co-op. I look forward to reviewing the book in a future blog post. Leaders of the November Platform Cooperative conference, Trebor Scholz and Nathan Schneider, continue advancing the conversation. Trebor was recently interviewed for a Shareable article (yes they really cover this stuff) about cities and Platform Cooperativism. Also see Nathan Schneider’s site internetofownership.net for a directory of online cooperative platforms and his great blog with news on technical co-ops. My excitement grows for cooperative platforms on the web. They can bring actual democracy and equality to the web by establishing diverse stakeholders as owners. And the movement is growing (See my earlier blog post: Platforms for a New Economy.) But we’re all wondering how they will be built, and be influential. We can start by looking at Loomio as a successful example. It’s a worker-owned web application that brings to us a networking and decision-making platform. I used Loomio for a recent political campaign. Our team was a group of 18. The best feature for us was preserving conversation threads. We were able to refer to past conversations saved in one central location. The collection of threads that accumulated was ideal for including newcomers in a particular discussion. Some exclusive conversations did need to take place by email instead of Loomio, but in Loomio anyone could start a new thread with a title and description. And the responses to a thread can be sent to your email address. The decision-making aspect of the platform, consisting of proposals and voting, was useful. The few times we used this feature, the interface was clear and effective. You can start a proposal at any time, and a graphic pie chart tracks the popularity of the proposal. I see a lot of potential for this feature, and think it could be a great municipal voting tool. Beyond our use of Loomio, the New Zealand based co-op is successfully deploying the platform globally. A recent Yes magazine article written by Nathan Schneider describes how they obtained unique financing while retaining the social mission. They used redeemable preference shares with investors that keeps bottom-line decision-making with the cooperative. My brief research to understand redeemable preference shares brought me to the Wikipedia page: hybrid security which may or may not clarify them for you. Loomio is a practical tool, and a co-op. With the advancement of UX in user-friendly platforms such as this, we can start to use and appreciate real democratically-owned services on the web. As a network of co-ops builds in the US, redefining economics is resulting as well—a topic I’ve mentioned in several previous blog entries. There’s a mandate to develop an economy that includes solidarity. Other terms on the topic are: a sharing economy (which is defined differently depending on who you ask), or a generative economy. Efforts around the country are piecing together inchoate ideas for now, but show great thinking and promise. In April, RIPESS North America (Intercontinental Network for the Promotion of the Social Solidarity Economy-N. America) initiated a forum in Detroit to discuss solidarity in economics. The efforts to develop this forum exemplifies the solidarity of organizations to address progressive economics. RIPESS North America joined with the U.S. Solidarity Economy Network (SEN), the Canadian Community Economic Development Network (CCEDNET) and the Chantier de l’économie Sociale in Quebec to create the forum. RIPESS-NA formed a Coordinating Committee that also includes the Democracy Collaborative, the New Economy Coalition, the Rosa Luxemburg Stiftung and Detroit organizations, including: the James and Grace Lee Boggs Center to Nurture Community Leadership, the Center for Community Based Enterprise (C2BE), the East Michigan Environmental Action Council (EMEAC), and the Conscious Community Cooperative. It’s a mouthful, I know! With so many groups involved, these perspectives on economics can appear overwhelming. But the work of small efforts can combine and form larger impact together—in solidarity. The results won’t necessarily translate to an overarching economic policy that we’re used to. These many groups working together demonstrate that small can be a solution because they bring diverse thought, different answers for different people. I like to quote the great E. F. Schumacher and say that in regards to economics, “small is beautiful.” But uniting is the current challenge for solidarity economics and cooperatives. The Harvard Law School has provided community access to legal services with the Transactional Law Clinics (TLC) since 1979. TLC includes the Community Enterprise Project (CEP) in Boston’s Jamaica Plain. These organizations have put out the legal guide “Tackling the Law, Together” in a PDF that describes legal issues and opportunities for co-ops. This means legal structure! tax law! employment law! Yes, it is exciting stuff; developing legal strategies essential for co-ops. Although Harvard and the clinics are Massachusetts-based, the report addresses US law generally as much as possible. It was published in coordination with The Boston Center for Community ownership, The Boston Impact Initiative, the California-based Sustainable Economies Law Center. Legal structure is the first building block of a formal co-op and there are some to choose from: corporation, benefit corporation (different from the “b-corp” designation), cooperative corporation, and LLC (limited Liability company). Non-profit status is considered not applicable to co-ops that generate profits for owners. Then, did you know, that separate from your legal structure, you can be taxed as something else? And the Subchapter T of the Internal Revenue Code (IRC) can be especially advantageous. See the report for more on tax law, immigration law, co-op conversions, and more. It’s a 47-page overview and “does not constitute legal advice” – like this blog post. Laura Flanders is taking notice, too, of cooperative law. She recently interviewed Janelle Orsi from Sustainable Economies Law Center (SELC) on the subject. Also interviewed was Micky Metts from the Agaric cooperative. So, check out the report from CEP and the Laura Flanders interview. Defining the sharing economy continues. An inspiring event took place at the Goethe Institut in New York, January 21st. 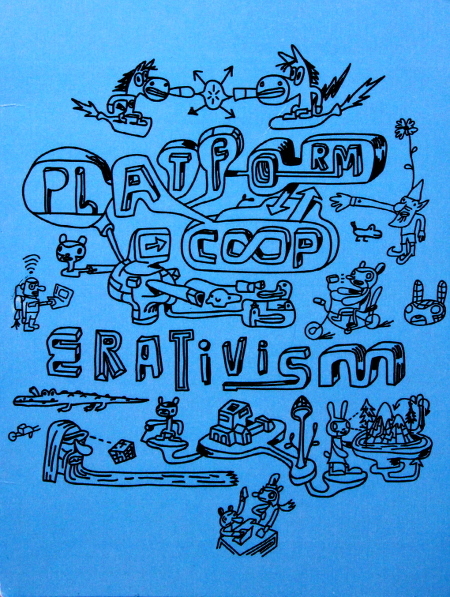 In previous entries I wrote about Platform Cooperativism, that took place in November. This was a follow-up event with a gifted panel of experts questioning the current “sharing economy” and what it could be. Panelist Trebor Scholz who coined the term Platform Cooperativism has again convened thinkers and solutions that spread wealth and ownership to workers. Following the November event Trebor wrote an educational and inspiring report, Platform Cooperativism, published by the Rosa Luxemburg Foundation. It describes the reality of the “on-demand economy” we have today, often described as a sharing economy, where “companies like Amazon, CrowdSpring, and Taskrabbit” are creating more damage to society and workers than their supposed innovation. The result is “Platform capitalism” coined by Sasha Lobo and Martin Kenney. Scholz writes: “platform capitalism, so far, has been highly ineffective in addressing the needs of the commonwealth. What initially looked like innovation, eventually cranked up the volume on income inequality.” Uber and CrowdFlower are other examples. Other panelists at the Goethe-Instiut were Brendan Martin, Felix Weth, Chelsea Rustrum, and Emma Yorra. Brendan Martin, founder of Working World gave some great perspective on what we’re confronting with ownership in today’s sharing conversation. Class warfare has repeated itself, and we are facing an age-old problem, he said. This puts discussions of ownership into perspective. Common grain storage in ancient times, for example, may have been stored for the common good, however, eventually ownership consolidates to fewer and fewer owners. Then the disadvantaged seek ownership again from the wealthy few, and the process repeats itself. This cyclical pattern reminds me of Saul Alinsky’s observation in his book Rules for Radicals where those that lack power may eventually get it, then conversely fight to keep it. This yin yang pattern in both ownership and power should be kept in mind. Panelist Felix Weth is the founder of Fairmondo, mentioned in my last post. The German-based co-op is spreading into the UK. Hopefully there will be expansion into the US. Chelsea Rustrum had a great message that sharing can actually be an advantage. She is a co-author of It’s a Sharable Life. In an earlier blog post I show that co-ops can outperform traditional capitalistic business models. Sharing of wealth at co-ops could exemplify this kind of advantage. At the Platform Cooperativism conference the term stigmergy was presented as a model studied by Joel Deitz and others. If groups have superior ways of coordinating then competitive advantage could result. Panelist Emma Yorra has an impressive resume working with co-ops in New York and Working World in Nicuaruagua. She also mentioned collaboration with the oft mentioned financial co-op in platform cooperativism: Robin hood. Sharing is a topic I believe all businesses should take seriously for practical reasons. 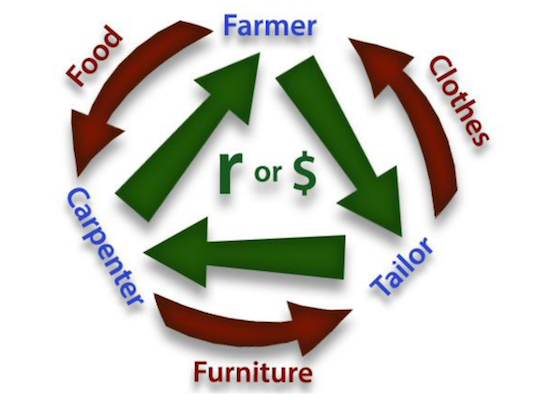 I write this blog because co-ops share ownership, wealth, responsibility, and advantage. Cooperative platforms are no different. I think about economics a lot lately thanks to the Platform Cooperativism conference at the New School in New York. This is my second blog post about the cooperative topics discussed that ultimately address for me the all-important topic of wealth distribution. Prosperity can spread by borrowing the best qualities of today’s businesses and then structuring them democratically. Some innovative cooperative platforms already exist; capitalism can be modified as we can potentially teach corporations new and valuable forms of transaction; and government can help, too. 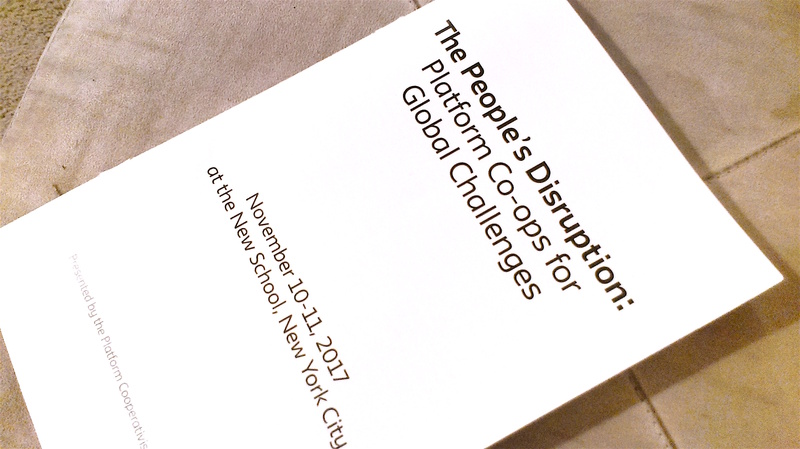 I was lucky to attend the Platform Cooperativism conference on November 13 and 14 at The New School in New York City. It was convened by Trebor Scholz from The New School and Nathan Schneider from the University of Colorado. The event focused on existing cooperative platforms, such as co-ops, web apps, peer to peer engagement, and considered what can be built in the future. In this blog post I wanted to mention some general themes that struck me at the conference. Like Black lives, Black co-ops matter, now and historically. Collective Courage by Jessica Gordon Nembhard is an inspiring and thorough survey of the long history of collective action taken by African Americans in the US as far back as the 1700s. Against adversity, the African American community has created a legacy of cooperation that still exists. The earliest efforts built communal ways of supporting each other, and built the foundation for formal businesses. These efforts enriched many during the ebb and flow of US co-op history throughout which African Americans have been contributors. I’m not one to write about spirituality, and wouldn’t deem it appropriate for this blog, but a series of events happened a few days ago related to co-ops that I can’t help but describe as Carl Jung’s concept of sychronicity — a “meaningful coincidence.” Lately I’ve been reading Jessica Gordon Nembhard’s Collective Courage on the history of African American co-ops, in which the great sociologist and proponent of co-ops W.E.B. Du Bois is featured. His research is essential documentation of the Black struggle and cooperative development in the late 1800s to the 1950s. With this information in my head, my wife and I were choosing a place in New England to hike and stay overnight. The Democracy at Work Institute, a sister organization of US Federation of Worker Cooperatives (USFWC), released a report this year called US Worker Cooperatives: State of the Sector that gives an overview of US worker-owned co-ops. The report observes that much has been said about worker co-ops internationally, but that US worker co-ops as a whole have lacked analysis. The report tallies 256 worker co-ops in the US. A small number, likely an underestimate due to lack of data, but the report concludes US worker co-ops — known for delivering social, democratic, and community benefits — deliver impressive profits and growth. At this year’s ECWD in Worchester Massachusetts, I was lucky to attend the opening plenary, Saturday morning July 11. 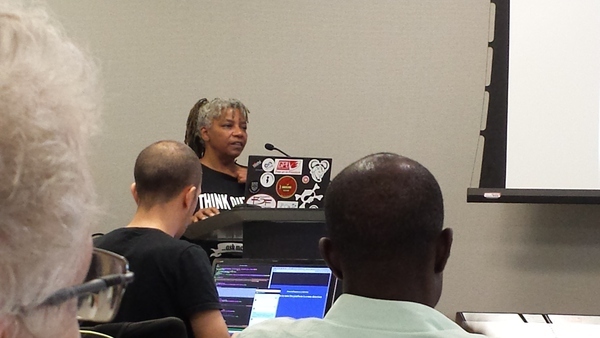 Author Jessica Gordon-Nembhard got the plenary started as moderator by reminding us that co-ops build society. Jessica wrote Collective Courage, is a political economist, and Professor of Community Justice and Social Economic Development at John Jay College, at the City University of New York (CUNY). Co-ops solve current issues, she said. They provide dignified work, give back to society, create livable wages, deliver products, and stabilize communities. The 800th anniversary of the Magna Carta was this month. Democracy Now! reported on the event and interviewed Peter Linebaugh on June 15th, the day of the anniversary. He is the author of The Magna Carta Manifesto: Liberty and Subsistence for All. As Linebaugh describes, what is so significant about this “Great Charter” is the recognition of certain civil rights when it was sealed in 1215. Because I advocate co-ops as a means of creating equity, this document is an intriguing part of history that not only established habeas corpus, but as pertains to cooperatives and a sharing economy, the document is a pivotal point in history to recognize and value the commons. At the time it was written, the commons were the forests of Britain and a source of valuable natural resources such as wood. According to Linebaugh, laws allowed for hunting without capital punishment and established rights for women to use the resources of the commons. Recognizing and protecting the commons is a very pertinent topic today whether we’re discussing the world wide web or the earth’s oceans. My belief is that co-ops offer a small way to address sharing that can impact commons such as these and many more. What is more ubiquitous than Google? Because of this, I declare today the first day of MGAWOC: Make Google a Worker-owned Co-operative. Below are 10 co-operative initiatives to inspire a Google worker-owned co-operative. And they happen to be Google’s company philosophy (slightly modified here). Google lists them at What We Believe. In my previous CommonBound conference blog entry I described the workshop I attended with Marjorie Kelly and Janelle Orsi. I wanted to also write about their idea of applying Elinor Ostrom‘s “design principles” of stable local common pool resource management (CPR) to the governance of co-ops. Ostrom won a Nobel prize in 2009 for economics. Kelly and Orsi gave a handout on her principles, and how these principles can apply to co-ops. I’ve taken directly from the handout below. CPR is about common resources, therefore, the concepts don’t translate directly to worker co-ops, but still offer interesting possibilities for governance design. Workers as stakeholders correlate in this instance as “resource appropriators” in an enterprise. In bold font is the principle from Ostrom, also found on Ostrom’s Wikipedia page. Following each principle is a suggested application to co-ops from Kelly and Orsi. 1. Clearly defined boundaries (effective exclusion of external un-entitled parties). How can a worker co-op clearly define who is a member and how to become a member? What should be the barriers to entry? How can members resign or be expelled? 2. Rule regarding the appropriation and provision of common resources that are adapted to local conditions. Adopt rules about how much people are entitled to work and about ideal working conditions? Adopt rules that prevent some workers from capitalizing off the labor of others? How will this vary based on local conditions, i.e., the type of business? 3. Collective-choice arrangements that allow most resource appropriators to participate in the decision-making process. How can worker co-ops enable all workers to participate in the decision-making process? Collective governance? Distributed governance structures? Holacracy? 4. Effective monitoring by monitors who are part of or accountable to the appropriators. Designate someone who makes sure that the rules are being followed, that the co-op is in good health, and that the values of the co-op are being upheld? 5. A scale of graduated sanctions for resource appropriators who violate community rules. What could sanctions look like in the context of a worker co-op? Cutting hours? Reducing decision-making power temporarily? Put someone on toilet-cleaning duty? 6. Mechanisms of conflict resolution that are cheap and of easy access. How can a worker co-op make conflict resolution cheap and easy? Internal conflict resolution training? Internal conflict resolution team? Agreements with other cooperatives to mediate one another’s conflicts? Agreements with local community mediation centers? 7. Self-determination of the community recognized by higher-level authorities. Self-determination partially means that outside investors can’t control the co-op. Self-determination is limited by government-imposed regulations dictating the ways that co-ops can structure relationships between employer/employee, investor/business, etc. 8. In the case of large common-pool resources, organization in the form of multiple layers of nested enterprises, with small local CPRs at the base level. 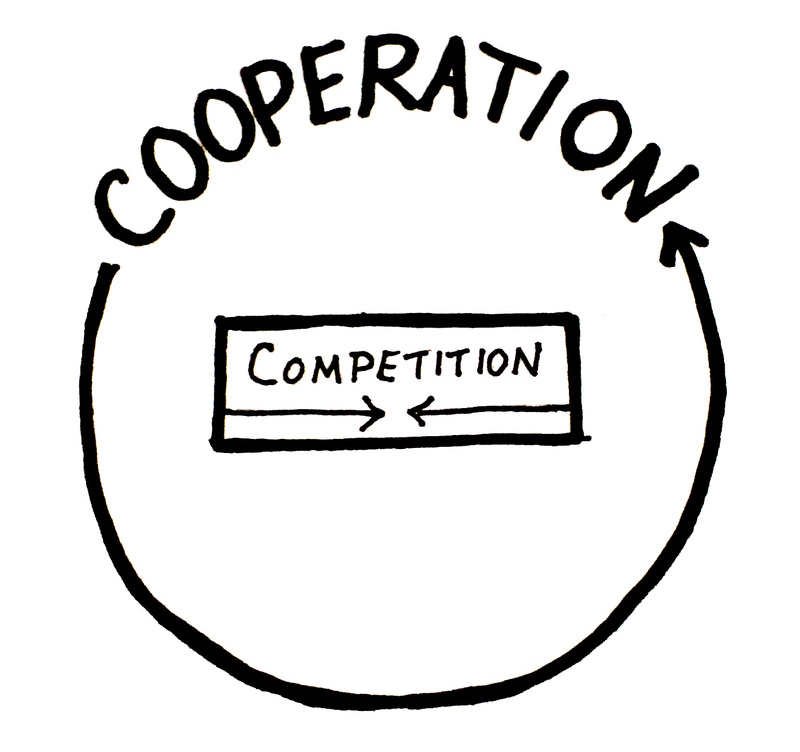 Create semi-autonomous circles of management within a larger co-operative? Nest co-operatives within larger networks of co-operatives? Co-ops of co-ops? June 6th through 8th I attended CommonBound, a conference to consider directions for a new economy, organized by the New Economy Coalition (NEC). A significant part of the future outlook is co-operatives. One workshop I was lucky enough to attend was run by Marjorie Kelly and Janelle Orsi on social enterprises. Marjorie Kelly has been a pioneering writer on ownership; I noticed that her concepts of generative and extractive economies, were used widely elsewhere at this conference and appear to be integrated into the narrative for economic change. Janelle Orsi is an attorney and writer, well-known for her work based on sustainability, equity, and sharing. Their workshop demonstrated that local interests can suffer without local investment: if Wall Street controls a company, is there any incentive to invest in local communities? It’s a question that came up again elsewhere at the conference. How can co-ops afford to support business ideas like serving less profitable clientele and communities? The answer: democratic ownership and decision-making. Such an ownership structure allows for investment of surplus income that may not be strictly for profit. 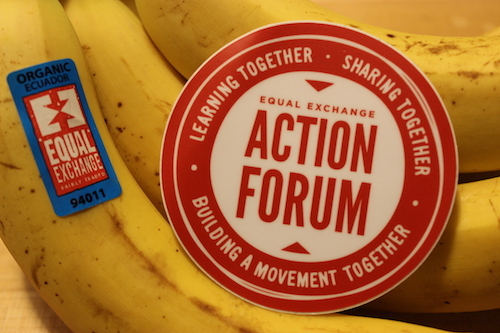 Equal Exchange was mentioned as a leader in this area with the ability to focus resources on ethical food production that might be a financial risk, e.g., supporting banana farmers. Governance makes it happen. Governance is the management structure of an organization, also known as bylaws. The importance of governance was a guiding message from the Kelly/Orsi workshop. The composition of governance is critical and should be set up with careful consideration. But it can, and will most likely, be difficult work. A later workshop described the work involved in converting to a co-op that took 18 months for the landscape company, A Yard and a Half Landscaping, located in Waltham Massachusetts. That same workshop featured Cero a new Boston-based co-op that will collect restaurant waste and has wrangled with start up challenges for over a year. Co-ops come in all shapes and sizes, but it is the governance that defines their organizational principles. Stacey Cordeiro of the Boston Center for Community Ownership outlined this in a workshop on co-ops. As Janelle Orsi described, a co-op can start to be defined by a tax status provided by the U.S. government called “Subchapter T.” It will provide a co-op with a tax structure supplied by the IRS, and start to provide bylaws for its management. Cordeiro outlined three components of Subchapter T as: 1. Subordination of capital. 2. One member, one vote, and 3. Operating at cost. Co-ops are part of a movement to include all walks of life. Melissa Hoover and Joe Rinehart from the US Federation of Worker Cooperatives presented and discussed diversity in co-op development, and the importance of a venue for multi-language interaction. Co-ops can be all-inclusive and need to consider new approaches to inclusion. The CommonBound conference made an effort and was successful in bringing a diverse group of people together. NEC generously and wisely offered scholarships which helped me to attend the conference. Co-ops are helping to change the world, but like any other part of change, they are hard work. Designing the governance of a co-op is a good example. Co-ops compel people to work together democratically to form and then run a co-op — the development of a democracy is work, and then the democracy it creates is work. A contradiction perhaps, but I don’t think anyone wants a work-free future. We’re looking for an inclusive future where we’re all doing work we love.